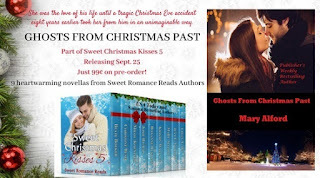 I'm so excited to announce the release of Sweet Christmas Kisses 5 happened yesterday! Here's Chapter One of Ghosts From Christmas Past, my contribution to the nine sweet holiday romances in our box set. Light seeped into inky darkness, at least, that’s what she sensed. She struggled to open her eyes. They felt glued together. The blackness had been her comfort for so long and she was afraid. Today was different. Today, it was time to leave the darkness behind. With all her strength, she forced her eyes open. Nothing but blurred visions appeared before her. And light. So bright. Slowly, the cloudy haze lifted and she stared up at a stark white ceiling, almost blinding in itself. She blinked several times. The ceiling was still there, yet her brain was blank. Forcing back the panic, she glanced around. She was in a room as bland in personality as the ceiling. Nothing. She remembered nothing. Where was she? Who was she? “Oh my dear word, she’s awake! Charlotte Swenson is awake! Quick, get Dr. Montgomery. Now.” An unfamiliar female voice stressed the word. Footsteps faded. A woman’s face entered her line of sight. She was smiling, her green eyes alight with happiness. Salt and pepper hair framed her face. The woman clasped her hand, squeezing it. “How are you feeling, Charlotte?” she asked. Charlotte? Her name was Charlotte? It didn’t sound familiar at all. Panic swirled through her body. The woman must have sensed the panic in her eyes because her smile disappeared. “Now, don’t you worry.” The woman tried to comfort her. “Dr. Montgomery will be right here to explain everything.” She expelled a noisy sigh. “I can’t believe you’re awake. Eight years! I’ve heard about patients who wake up after so long, but I’ve never witnessed it for myself. It’s a true miracle. A Christmas miracle.” The smile returned. Charlotte blinked. Then one more time, but the woman was still there. Still unknown. And nothing but blackness filled her memory. Tears shown in the woman’s eyes. She was talking still, too fast, but Charlotte had no idea what she was saying. The alarm inside continued to spiral out of control. Why couldn’t she remember anything about her past? “Aw, there’s Dr. Montgomery now.” The woman smiled, appeared relieved, and turned to someone else. She nodded because he expected an answer. “Good, that’s good. Can you speak?” he asked. She had no idea. Her throat felt as dry as a desert, and yet she tried. “I think so.” The words came out slurred, croaky, barely a whisper, as if she hadn’t used her voice in a long time. Charlotte glanced around the room now filled with dozens of people. Something momentous was happening here. But what? Why couldn’t she remember that her name was Charlotte? Why was she here in this place? Eight years? She stared at him as if incapable of believing what he’d said, her eyes wide. Her face frozen in astonishment. Was this some type of sick joke? Something more coming. Something bad. “Are they okay?” she forced out. She waited for a reaction. Some feeling. Grief. Pain. Regret. Nothing came. Her lack of sentiment made her more frighten than anything. “I don’t remember anything about an accident,” she murmured, her voice thready, but not from lack of use. Now it was pure terror. The doctor patted her hand. “Tell me what you do remember.” he asked, some of his soothing tone slipping. Before he could cover his shock, she saw it. “This is not to be unexpected,” he managed, his tone back to reassuring. “You’ve awakened from a lengthy coma. Your memories are naturally fuzzy. Give it time. I’m sure they will return before long.” But he didn’t believe it—she could see it in his eyes. Charlotte’s thoughts reeled. “How old am I?” she asked, realizing she had no idea. She’d lost so much. Her parents. Her past. Where did she go from here? She was twenty-five years old and she remembered nothing. Charlotte struggled to keep the hopelessness at bay. Love your excerpt, Mary! 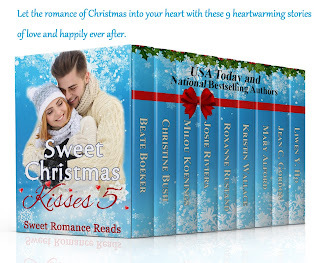 Can't wait to read all the stories in the Sweet Christmas Kisses 5 boxed set!